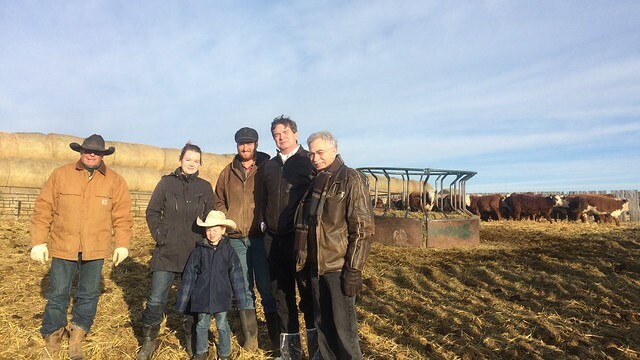 Agriculture and Forestry Minister Oneil Carlier and Medicine Hat MLA Bob Wanner, meet with producers affected by the bovine tuberculosis outbreak near Jenner, Alberta. “Today I have the privilege of visiting with some of our cattle producers and their families on their farms in southeastern Alberta. Several ranchers in this area are affected by the ongoing Canadian Food Inspection Agency (CFIA) investigation into bovine tuberculosis, and it’s important for me to meet with them and hear firsthand about their experiences. “While the investigation has created many challenges for these producers, I continue to be inspired by their resilience during this difficult situation. They know how important it is to protect our livestock and markets from disease. Despite the complex challenges involved, they are stepping up to do what’s necessary to ensure the health of Alberta’s and Canada’s animals. “There are many people and organizations who are committed to supporting our cattle producers during this time of financial, logistical, and emotional stress. In addition to the individual farmers, I would like to thank Alberta Beef Producers for their hard work on behalf of the industry. “Our federal government partners at the CFIA and Agriculture and Agri-Food Canada, along with Alberta’s Agriculture Financial Services Corporation and staff across the Alberta government, are all working around the clock to deal with this ongoing situation and provide assistance to farmers.